Peanut and oats Laddu are silky, soft and delicious. 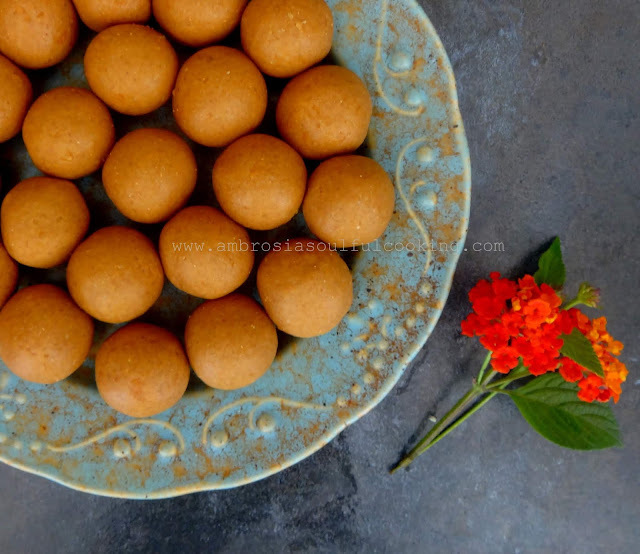 These laddu make an excellent healthy snacking option. These are absolutely fatfree. The creaminess of ground peanuts and soft jaggery helps in binding. There is something very charming about life in the villages. The simplicity, the rusticity, and the easy-paced life is in harmony with the rhythm of life within. Most of our villages in the foothills are still not completely imbued by modernism. Traditionally practices still score over the use of technology. Hence life is simpler, purer and better. Most of the villages in the foothills have jaggery making units. Come winters and these units come to life and throbbing with activity. Long queues of sugarcane laden bullock carts wait for their turn to reach these units. A simple contraption crushes the sugarcane and presses the juice out of it. Multiple layers of cotton strainers filter the juice which is then led to huge iron vessels where the juice is boiled until it reaches a desired thick consistency. This is then set into blocks. This is how we get golden sweet and healthy jaggery that is unrefined, without chemicals and an excellent substitute for refined sugar. We use it in our soups, chutneys, bakes, brittles, and laddus. Jaggery has immense health benefits. Jaggery is rich in vitamins and minerals. It is a great immunity booster and blood purifier. It is a natural cleanser that efficiently cleans the respiratory tract, lungs and food pipe and stomach. It is highly recommended for people working in polluted zones. Jaggery helps in preventing anemia. It is rich in potassium and sodium and is known to control blood pressure. Jaggery is a very good source of energy. It is a complex carbohydrate that gives energy to the body gradually and for a long time. Recently we got two blocks of jaggery from the neighbouring village. We had some homemade peanut butter. 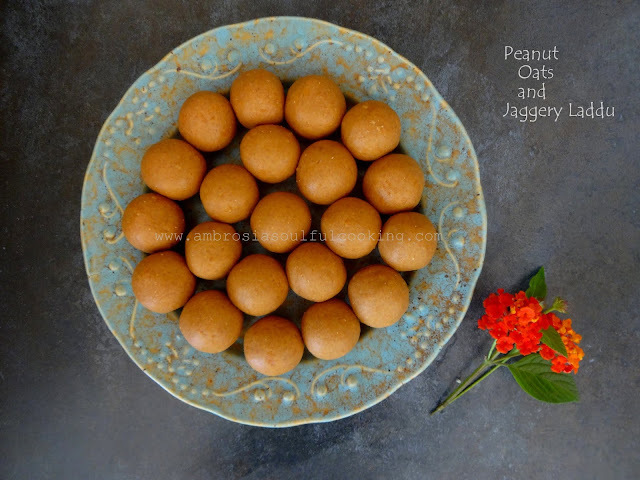 We used jaggery and peanut butter to make Peanut Oats and Jaggery laddu. 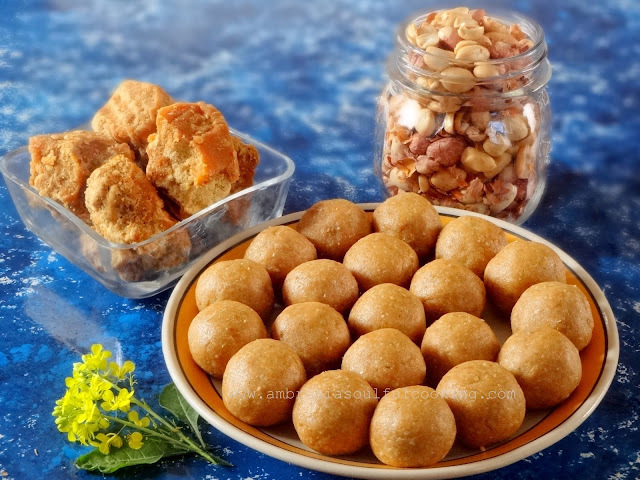 The laddus have no added fat and are delicious. We love having them post lunch and dinner and also with tea. We get fresh Jaggery in winters. 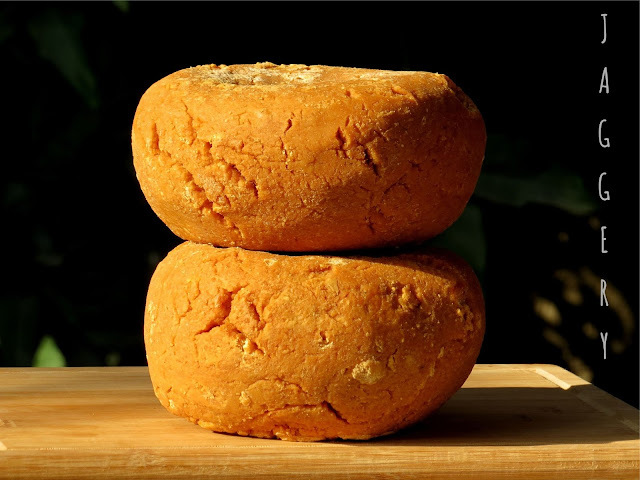 Use the winter jaggery that comes in cakes/blocks and is unrefined, soft and pliable. Do not use jaggery powder. It will not bind the mixture into laddu. If you want to make your own peanut butter like me, find the recipe here. We make these laddus every winter. Some improvisations happen in every batch. Recently we made the same recipe with a teaspoon of ginger powder. It added great flavour. We also used store bought oats flour in the recipe. 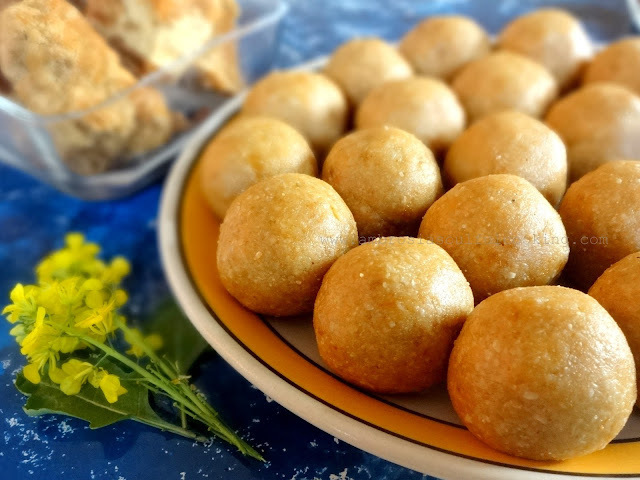 The fine texture of oats powder eased the binding of the laddu. Take peanuts in a baking tray. Preheat oven to 150 degrees. Set timer for 15 minutes. Toast the peanuts till they begin to crackle and turn golden. Or, take peanuts in a thick bottom wok. Roast till they crackle and become golden. Keep stirring during the process of roasting. Take oats in a thick bottom wok. Roast on medium flame till they become slightly crisp and the colour just begins to change. Let the oats cool. Take warm roasted nuts in a grinder and grind them to get a fine powder. Grind till the nuts begin to turn buttery. This will bind the laddu well. Grind oats to a fine powder. Transfer ground nuts and oats to a deep bowl. Add salt. Mix well. Take crumbled jaggery and add to the mixture. Mix with hands. Break lumps of jaggery if any. Btw, how do i crumble the jaggery - do you mean to grate them? Laddus are looking very tempting and they are healthy too. I like to include jaggery in my dishes in winters. I will surely try this recipe.